A US-Albanian archaeological mission claims to have found the well-preserved wreck of a Roman cargo ship off Albania's coast, complete with some 300 wine jars — all empty, alas. 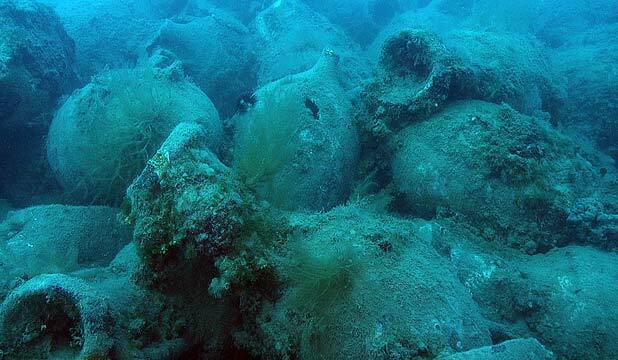 The 30-metre long wreck dates to the 1st century BC and its cargo is believed to have been the produce of southern Albanian vineyards en route to western European markets, including France. A statement from the Key West, Florida-based RPM Nautical Foundation said the find was made 50m deep near the port city of Vlora, 140 kilometres southwest of the capital, Tirana, early this month. The foundation, in co-operation with Albanian archaeologists, has been surveying a swathe of Albania's previously unexplored coastal waters for the past five years. So far, experts have located 20 shipwrecks — including several relatively modern ones. "Taking into consideration the date and also the depth — which is well suited for excavation — I would include it among the top 10 most scientifically interesting wrecks found in the Mediterranean," said Albanian archaeologist Adrian Anastasi, who participated in the project. Officials said most of the jars, known by their Greek name of amphoras and used to transport wine and oil, were unbroken despite the shipwreck. However, the stoppers used to seal them had gone, allowing their contents to leak out into the saltwater. Mission leader George Robb said the ship could have been part of a flourishing trade in local wine. "Ancient Illyria, which includes present day Albania, was a major source of supply for the western Mediterranean, including present day France and Spain,' Robb said. Team members retrieved one amphora for examination, before restoring it to the wreck. The site, whose precise location is being kept secret, will be left unexplored until the Albanian archaeological service is in a position to do so. The monthlong mission ended last week and will be resumed next year. According to Albanian coordinator Auron Tare, it will eventually cover the whole Albanian coastline. "These five years have shown how rich the Albanian underwater coastline is, and how interesting it could be for international tourists," he said.